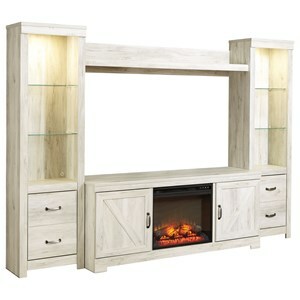 The rustic gray finish over replicated oak grain of this entertainment wall unit set creates an inviting look for your home. The TV stand, center bridge shelf, and two piers have a casual farmhouse design. In particular, the angled crossbuck details and round door hardware in a dark bronze finish of the TV stand add charm. The set's simple clean lines make it an appealing choice for your entertainment space. The piers each feature two glass shelves and a built-in light make it ideal for highlighting accents. The base of the each pier has a door with an adjustable shelf and fixed base shelf inside for bonus storage. The Wynnlow Wall Unit with 2 Piers in Rustic Gray Finish at Van Hill Furniture in the Grand Rapids, Holland, Zeeland area. Product availability may vary. Contact us for the most current availability on this product. Storage TV stand: The center shelf is removable. Behind each door is a fixed base shelf and adjustable shelf. Media opening: 23" W x 18.5" D x 19.75" H. Side door opening (2): 18" W x 18.5" D x 19.75" H. Each pier: one door opening: 15.5" W x 12.5" D x 19.25" H.
Browse other items in the Wynnlow collection from Van Hill Furniture in the Grand Rapids, Holland, Zeeland area.